I dropped off a bit, since I had to stop sightseeing, mostly, and go to work. I spend Monday kicking around the hotel, with a short aborted mission to a shopping area. After 45 minutes in smoggy bumper to bumper traffic to the recommended shop, I was unable to communicate with the clerks. I got back in a cab and spent 45 minutes in bumper to bumper smoggy traffic to get back to the hotel. I then spent the afternoon preparing for the FH meeting, which was to begin with dinner that evening. Dinner was a lively and delightful affair at a restuarant on an artificial pond. Good food and lot’s of bonding among the FH people from around the world. 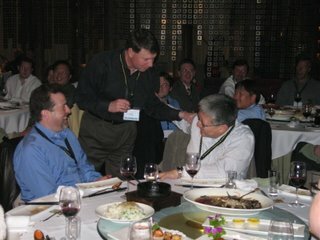 The picture above is of Paul offering a toast to Li Hong, our host for the meeting. That’s Ed Manning from KP Public Affairs from Sacramento on the left. High point of the night for me was when I finally got up the nerve to ask Li Hong about Tianneman Square. I’ve been reluctant to bring it up with any of the locals, not knowing whether it was politic. Well, as it happens, Li Hong was one of the demonstrators and he was very willing to discuss his experiences. He marched in two parades on the day of the massacre and knew people who were killed. He’s convinced that history will overcome the governments unwillingness to confront the reality of this event. My esteem for Li Hong soared when I heard this story.